I will give you all the nations for an inheritance. In the Scriptures, illness was associated with sin and evil. True or False? All those baptized share in the priesthood of Christ. True or False? St. Elizabeth Ann Seton was born in New York City in 1774. She was raised as a devout Episcopalian. At age 19 she was married to William Seton and had five children. William died when Elizabeth was 29 and she then joined the Catholic Church. This action caused her family and friends to reject her. Bishop John Carroll invited her to Baltimore to start a Catholic school. It was the first Catholic free school in America. She died in 1821. Where can anointing of the sick take place? Not many details are known about St. Daniel. He was a Jewish convert and deacon to St. Prosdocimus, bishop of Padua. He did missionary work and was martyred for his efforts. He died in 168 at Padua, Italy. What elements are offered at Mass to become the body and blood of Christ? The church revised the calendar of the Church to honor these two great Doctors of the Church and good friends on the same day. Basil was born in Caesarea in 330. His parents and several brothers and sisters were honored as saints. 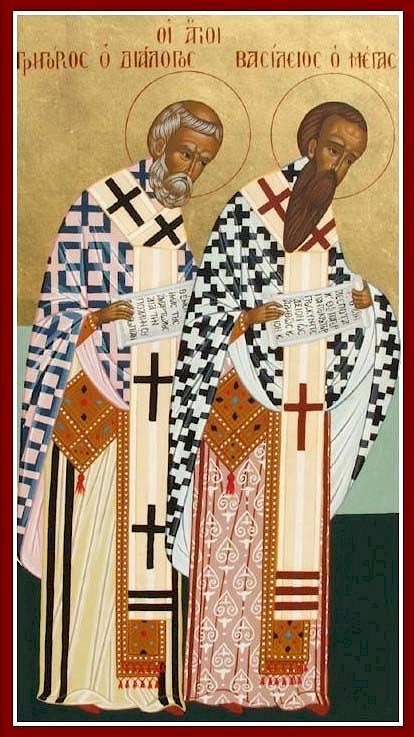 While attending school in Athens he met St. Gregory Nazianzen in 352. After having a school in Caesarea and was a lawyer, he became a monk. He founded several monasteries, and was ordained and in 370 he was made Bishop of Caesarea. He died in 379 and is the patron of hospital administrators. St. Gregory was born in Cappodocia. Both of his parents were made saints. He met St. Basil during his studies in Alexandria where they were students. He was baptized by his father when he returned to Nazianzus and led a holy life. He was ordained a priest and was appointed Bishop of Sasima by St. Basil in 372. He wanted to live a life of quiet and reflection but circumstances prevented this. He was made Bishop of Constantinople in 379 . He resigned this position in 381 and returned to a life of solitude where he died in 389. How many gifts of the Holy Spirit are there? From eternity, God had Mary chosen as the Mother of God. Mary became the Mother of God at the Annunciation. It is her most exalted title. This is the source of all her other privileges. At the crucifixion, Christ gave His Mother to be the spiritual Mother to all men. Thus, through her they could come to Him. This feast is in place of the Maternity of Mary formerly kept on October 13. May God bless us in his mercy. The Gospel of John records Jesus’ words that no one can enter the kingdom of God without being born gain of water and ______. St. Margaret was born in Hungary in 1046 and at the age of 24 married King Malcom III. Together they had six sons and two daughters. Spiritually influencing her husband, she helped him calm his temper and inspired him with good thoughts. She formed her own children to share in her strong faith. They acted out in her example by praying and helping the poor. She died on November 16, 1093. St. Albert was born into a noble family in Swabia, Germany in 1206. At the age of 17 he entered the Dominican Order and received his doctorate from the University of Paris in 1245. St. Albert was one of the great teachers of his time and was named regent of the studia generalia at cologne in 1248. St. Thomas Aquinas was a pupil of his. Known as athe “Universal Doctor” some of his great writings are Summa Theologiae and Summa de Creaturis. He was appointed provincial of the Dominicans in Germany and later Bishop of Regensburg in Germany. He assisted at the Council of Lyons in 1274 and defended the teachings of St. Thomas Aquinas at the University of Paris against those who accused the great theologian of heresy. He is the patron of those who study the natural sciences.